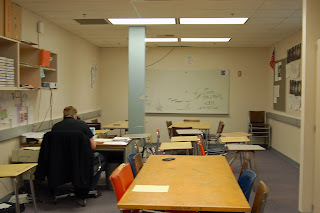 This is Brian's classroom. It's an old science department room, hence the odd shape and weird shelving. There are also no windows. Boo. 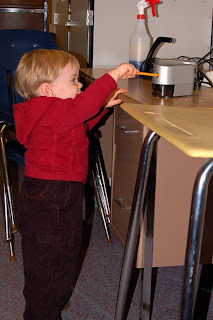 Cory found the electric pencil sharpener... he thought it was fantastic and made lots of "noise". After this we went and ordered my birthday cake at Baskin Robbins and Cory was looking at all the ice cream so we got a small cup. He sat on his own chair with his own spoon and we ate Rainbow Sherbet. He just looked so grown up sitting there, it was precious! Then we went to the grand opening of the new Great Harvest Bread Company! If you don't know what this is... oy, you are missing out! When we found out they were opening one here I realized that our bread budget was going to go through the roof! One loaf costs anywhere from $5.25 to $6.95, but is it ever worth it! They make their bread fresh every day and don't sell the day old stuff. Either the employees take it home or they donate it to local homeless shelters! They use only natural ingredients and their flavors are heavenly! Brian's favorite is Garlic Cheese, but I think I like the Garlic Rosemary better! And, every time you go in you get a free slice of warm bread! Yum! Since we are a bread loving family it was fun to take Cory in there! Its some variation of garlic for the Herling clan. Oh man, now you have me hungry for homemade bread. We do not have one of those here but that bread sounds wonderful...I love bread...especially fresh baked. Well, I love it when someone else makes it! I am not sure I could have the patience to do it myself! Seems like your birthday was wonderful...glad it was good!